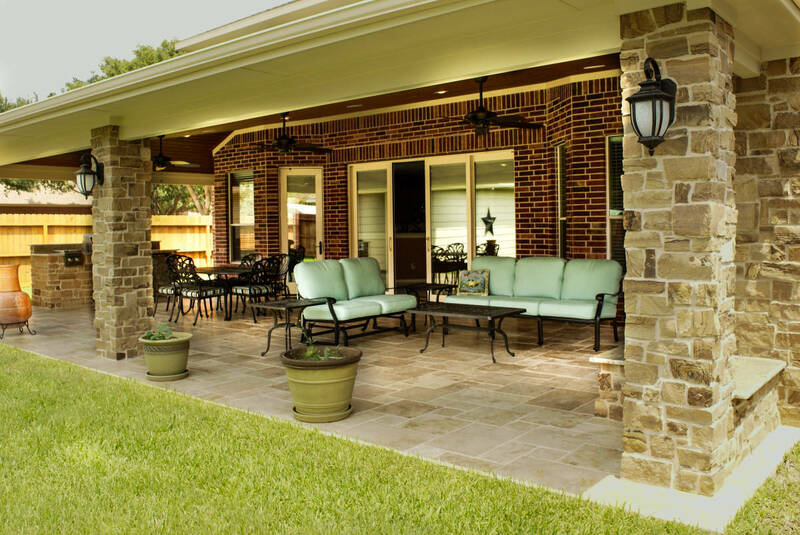 A simple, yet elegant design makes for a great outdoor living space. As most projects evolve during construction, so did this one. One of the biggest changes is the 12-foot door we installed in the living room. There was a fireplace with 4-foot windows flanking each side of the unit. We wanted to make the outdoor living space feel like it was part of the inside, so we removed the fireplace and added a large sliding french door with built in shades. As soon as you walk in the front door, the back sliding doors make it feel like the outdoor living space is part of the inside. As a beautiful centerpiece to the outdoor living room, this nicely sized fireplace and solid cedar mantel adds a wonderful feature for chilly nights. Vaulted tongue and groove ceiling gives this project some height underneath the cover. The sliding French doors really connect the inside to the outside living space. The kitchen area at the end of the covered patio is a small but very functional addition to this living space. Transforming a 2 story home to have a full patio cover along the back. The travertine tile flooring works great for this living space. Here is what we started with… The breezeway was incorporated into the new design.